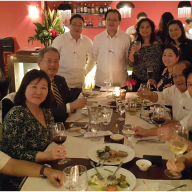 The conference, which also featured the Asian Japan Alumni (ASJA) International Symposium, was organized by the Japan Graduates Association of Malaysia (JAGAM) a year after it was held in Manila with the successful hosting by PHILFEJA under the leadership of Mr. Philip Sanvictores. The conference’s other major highlight was the holding of Japan Graduates’ Invention Exhibition with the theme “Japan Graduates Impact Lives”. The three PHILFEJA members’ product exhibitions won major awards. The presentation of product invention-innovation awards to PHILFEJA delegates. In his opening speech, Dr. Ooi Chee Keong, JAGAM president and ASCOJA chairman, explained that “the conference will provide the opportunity to discuss how Japan and ASEAN can work together in trade, tourism and technology for mutual benefit as it provides platform not only to share knowledge but also to foster better relationship and understanding among member countries.” His speech was followed by the keynote message of Y.B.Dato Seri Ong Ka Chuan, Malaysia’s second minister of international trade and industry. He described how “Japan remained as ASEAN’s third largest trading partner and the second largest source of foreign direct investment inflows.” He expects that these rankings will be strengthened substantially with the implementation of the ASEAN Economic Community and with the establishment of closer economic ties through various agreements such as the ASEAN-Japan Comprehensive Economic Partnership Agreement as well as the bilateral agreements signed between individual SAEAN member states with Japan. The three-day 22nd ASCOJA conference was also highlighted by an ASCOJA council meeting, a welcome reception, city tour and golf tournament. 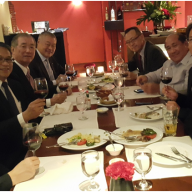 It was concluded by a dinner hosted by Japan ambassador to Malaysia-Dr. Miyagawa Makio, an invention awards presentation and ASCOJA members’ cultural performance, In the ASJA international symposium, Dr. Philip Ian P. Padilla, PHILAJAMES vice president, represented PHILFEJA by presenting a paper entitled “State of Science and Technology Education in the Philippines”. In the invention exhibition, PHILFEJA showcased three product innovations. These were the following: “Bioorganic Fertilizers: Working with Microbes for Agricultural production Sufficiency” by Dr. Mannix S. Pedro and “Increasing Crop Productivity with Vesicular Asbuscular Mycorrhizal Root Inoculant (VAMRI)” by Dr. Marilyn Brown. Dr. Pedro and Dr. Brown are both Japan-trained researchers at the National Institute of Molecular Biology and Biotechnology (BIOTECH), University of the Philippines Los Baños. On the other hand, Mr. Dan Leonard L. Rayo, president, PHILCULTAROS and Jose Clemente H. Zulueta, IT professional and expert of Samba Corporation and Portal 4 Youth Foundation, Inc. presented “SAMBACiTIES – an online directory dedicated in promoting tourism and businesses in the ASEAN Region and Japan. ” This innovation aspires in making businesses of ASCOJA members readily accessible to a broader community to provide value to its membership. The viewing of PHILFEJA and other ASEAN chapters’ booth during the ASCOJA’s Japan Graduates Invention Exhibition . 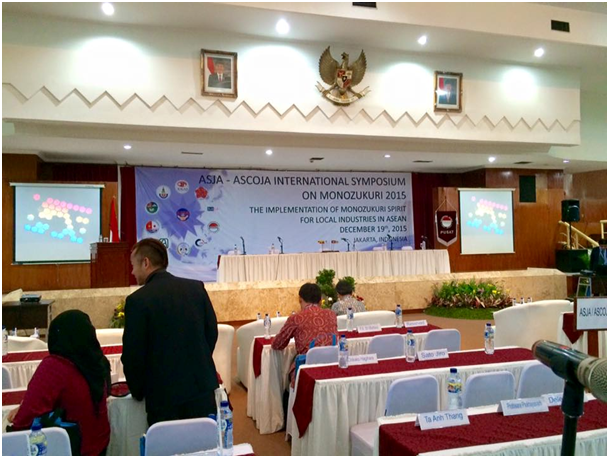 Onward to 23rd ASCOJA Conference in Brunei! As the conference approaches to its conclusion, conference delegates felt the celebration of success, warm friendship and hospitality, understanding and harmony. 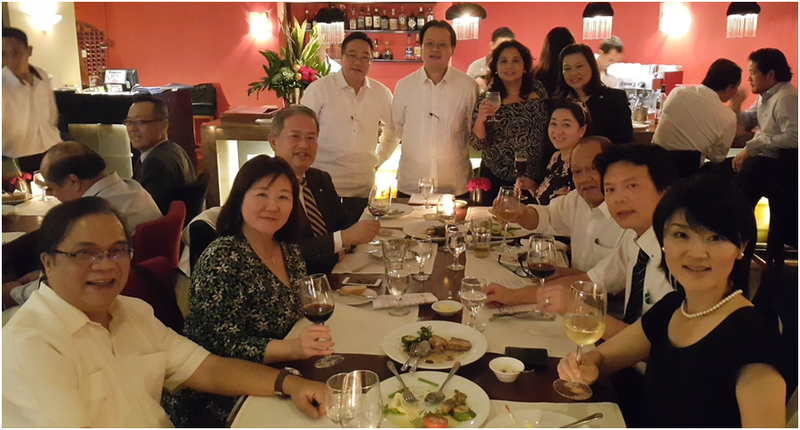 Finally, they realized ASEAN’s unity in spite of diversity and the social and economic relevance of Japan alumni in more years to come as they witnessed the memento presentation and handover ceremony with Brunei Association of Japan Alumni (BAJA), host of ASCOJA 23rd conference. 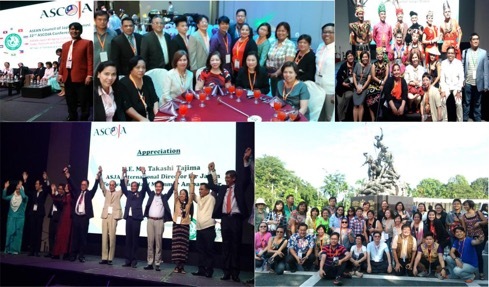 Conducting the ASCOJA conference in tandem with the ASJA symposium and Japan alumni exhibition of technology and innovation was a bold act and challenging task to do for these demonstrate the significant impact and contribution of Japan alumni in the ASEAN communities. “It was indeed a very enjoyable experience. My family had a grand time here”, says Dr. Ma. Luisa Enriquez, professor at DLSU and past president of PHILAJAMES. 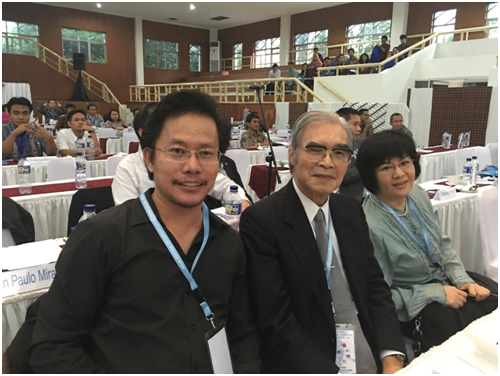 The PHILFEJA delegation in the 22nd ASCOJA conference, Malaysia. Kampai!! 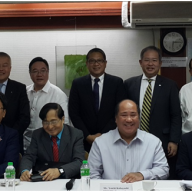 The Philippine Federation of Japan Alumni (PHILFEJA) elected University of the Philippines Los Baños (UPLB) Dean and Professor of Economics, Dr. Jose V. Camacho as its new president during its annual members’ assembly held last July 30, 2016 at the Amb. Jose S. Laurel III Hall in Dominion Building, Arnaiz Avenue, Makati City. Also central in the assembly was the submission of the amended articles of incorporation and by-laws of the organization, which all members approved unanimously. Speaking to the General Assembly, Dr. Camacho encouraged members to support the major activities of PHILFEJA in the coming fiscal year. 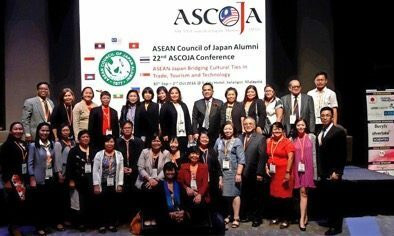 These include the 22nd ASEAN Council of Japan Alumni (ASCOJA) Conference scheduled on September 30-October 2, 2016 in Kuala Lumpur; the 40th Anniversary of PHILFEJA; and the Asia-Japan Alumni (ASJA)-PHILFEJA Symposium tentatively scheduled in February 2017. 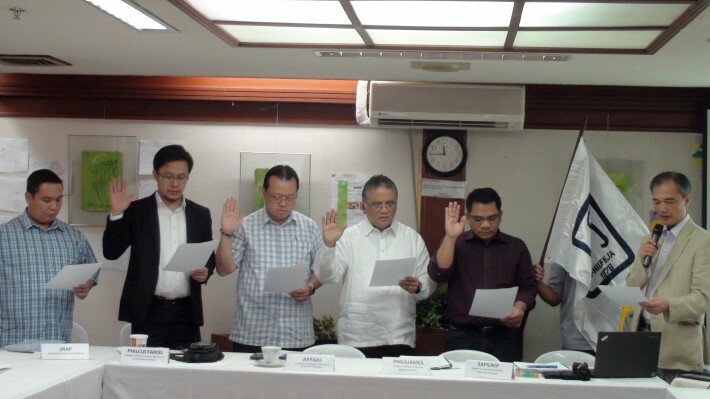 The auditing firm of Diaz, Murillo, Dalupan & Company was designated as PHILFEJA independent external auditors for the same fiscal year. After arriving at Soekarno–Hatta International Airport in Jakarta, we were picked up by the hosts from Indonesia together with Malaysian delegate, Law Yean Kok. Despite the long trip from Manila to Kuala Lumpur, to Jakarta, we were pleased by how organized the airport pickup was. 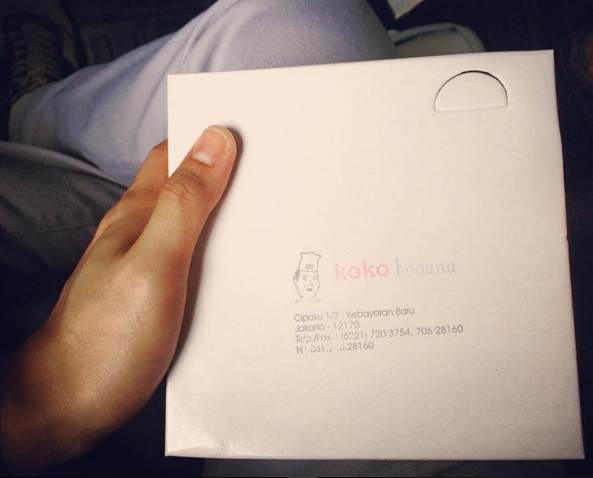 Not to mention, the scrumptious boxed meal of Indonesian desserts that we received while waiting for our ride to our hotel. Inside the cab, we had the chance to chat with the driver and Mr. Law Yean Kok about the similarities between Bahasa and Tagalog which kept us busy while braving the traffic. 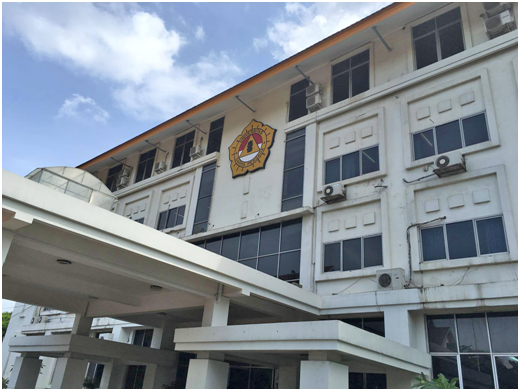 Soon enough, we reached an uphill leading us to the drop-off point of our accommodation—Hotel Sultan. That was the first word that came to our minds upon entering the lobby. We were provided keys to our own separate rooms as we registered for the event. The hosts welcomed us warmly with genuine smiles and handshakes. After appreciating our individual rooms and freshening up for the welcoming dinner, the participants and hosts came to the dining hall batch by batch. At 7 PM, The “Persada” formally opened the event. 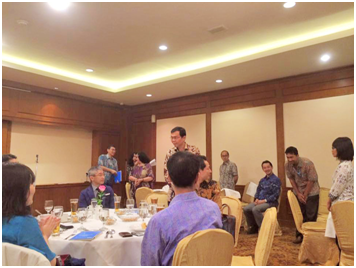 There were round tables and a decent array of Indonesian cuisine to choose from. 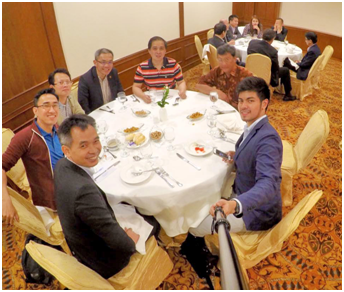 Delegates from different South-East Asian countries took this chance to network and talk about our involvements, our respective alumni societies—milestones and plans, even our common interests, ending up with casual pictorials. 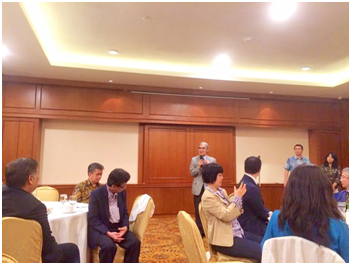 Sato Jiro Sensei thanked all participants for attending the event. After his speech, the hosts requested each participant to introduce himself in front of everyone and state the alumni society he/she represents. 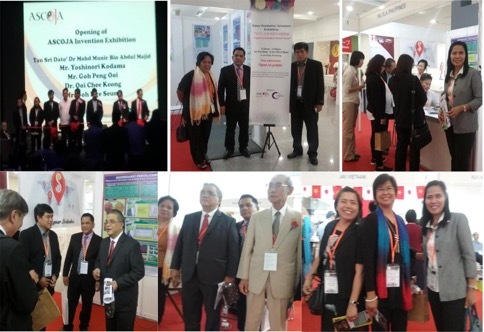 Moreover, we were pleased to have cultural exchanges with other participants which helped us better understand some differences and similarities among South-East Asian countries. 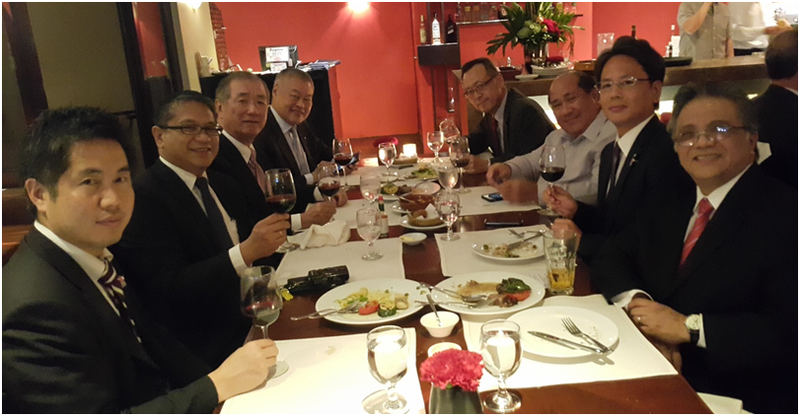 It was a fun dinner coupled with collaborative talks among delegates and this prepared us well for another information-packed day to come. Getting up from a cozy room, we had buffet for breakfast and immediately prepared for the symposium proper. 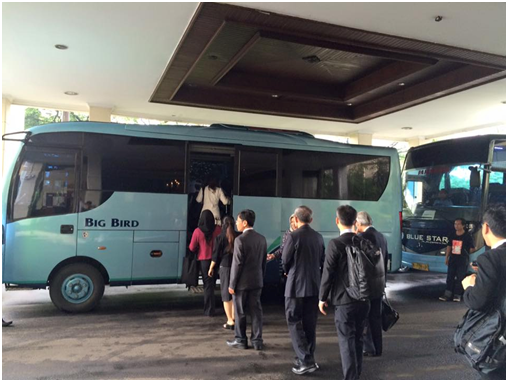 All of us were picked up by a bus to Darma Persada University where the symposium will take place. The ride was convenient. Upon arriving at 8:45 in the morning, we were welcomed by the student hosts in charge of the registration. There were seat designations and each participant was provided an ID and a kit that includes the compiled presentations of the speakers. 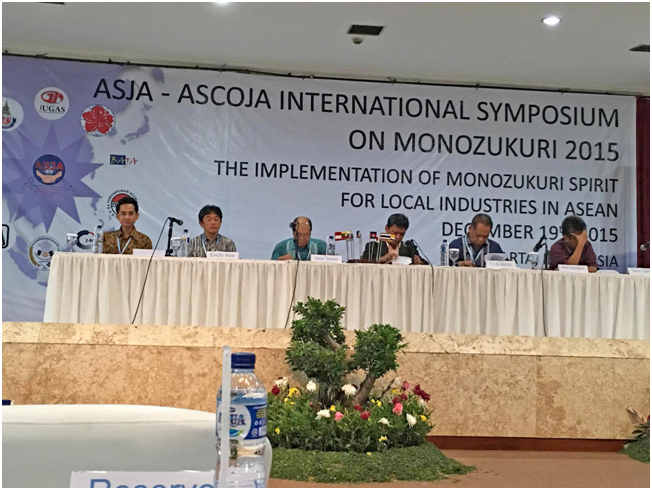 The symposium was divided into three sessions—The Philosophy of Monozukuri, Monozukuri from Industrial Practitioner Point of View and The Future of Monozukuri. For the first session, Mr. Heru Santoso talked about Monozukuri in Indonesia; while Mr. Daiki Kasugahara discussed it from JETRO’s point of view; Dr. Dadang Solihin talked about Darma Persada’s Monozukuri education while Dr. Ruttikorn Varakulsiripunth tackled Monozukuri education in Thai Nichi Institute. Lastly, for the third session, Mr. Tatsuhiko Hayashi shared how Industry 4.0 affects the future of the Auto Industry and Mr. Takuya Shimura ended the symposium with his talk on “HRD and Monozukuri”. Every after portion, we were given coffee breaks and lunch breaks furthering our chances to network and talk with other people. The speakers explained the concept of monozukuri in different ways coming from their own perspectives and experiences. It was a privilege to attend the event with such an interesting topic. We learned a lot about the Japanese concept of about how to create things not focusing on the item but on the person’s skills and on his/her innovative method of making it. Moreover, there is also this concept of hitozukuri which focuses on the person and how he/she undergoes a process that manifests the ingredients of personal maturation needed to improve one’s craftsmanship. Through the talks, we have somehow seen how these principles are reflected in the speakers’ work environments and realized how the application of these concepts perpetuates innovation in manufacturing. The symposium ended at around 5 PM. 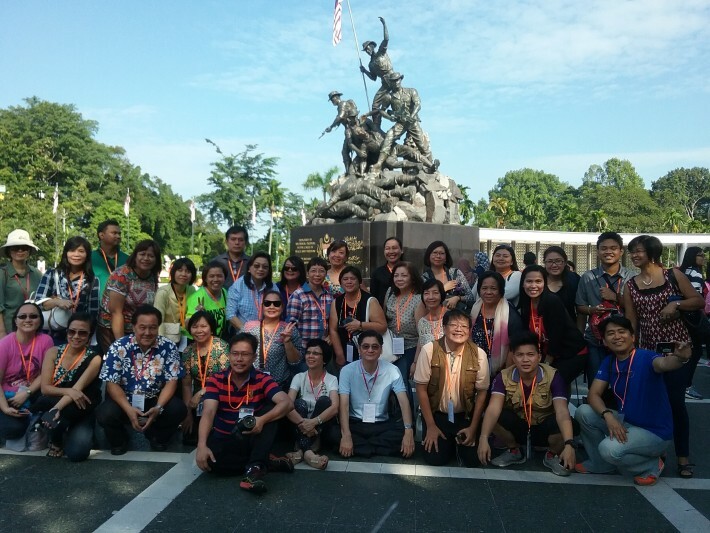 PHILCULTAROS (Philippine Cultural and Technical Association of Returned Overseas Scholars), a member association of PHILFEJA represented the Philippines in the ASJA-Persada Symposium on Monozukuri held from 18-20 December 2015 in Jakarta, Indonesia . 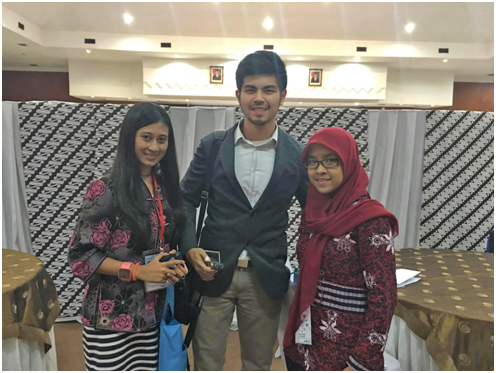 This article is the full report of Mr. Rayo to PHILFEJA on his participation in the Symposium and is published in this website with his permission. 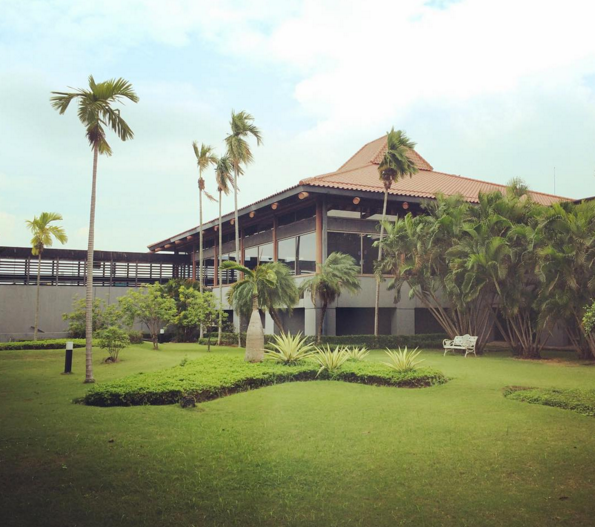 ASJA International of Japan announced in early October the schedule of four symposia to be held in association with counterpart ASCOJA associations in Vietnam, Indonesia, Thailand and Singapore. Click this link for a more detailed prospectus of the Series.